Provide comfort for the family of Patricia Carroll with a meaningful gesture of sympathy. 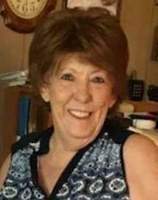 Graham - Mrs. Patricia Ann Carroll departed this life on Monday, February 4, 2019 at her residence in Graham at the age of 74 years, 6 months, and 24 days. Services are scheduled for Thursday, February 7, 2019 at Alexander Gray Funeral Home Chapel in Wilson with Pastor Richard Lakey and Thad Kassheimer officiating. Interment is scheduled at 2:00 P.M. Thursday at the Stroud Cemetery in Stroud, OK. Services are under the care and direction of Alexander-Gray Funeral Home in Wilson. Mrs. Carroll was born on July 11, 1944 to the late Mr. Henry Finney and Mrs. Goldie Mae (Boswell) Finney in Muldrow, OK. Patricia grew up in several places throughout her childhood but was always fond of Rogers, ARK. Patricia was a loving mother and grandmother and always enjoyed spending time spoiling her grandbabies. Mrs. Carroll always looked forward to her family getting together on the holidays and summer cookouts. Patricia had worked as a CNA for 34 years and had worked at Elmbrook for many of those years. She and Mr. David Carroll were married on April 8, 2000 in Depew, OK. Together they made their home in Graham in for the past 18 years. Patricia will be missed by all that knew and loved her. She is preceded in death by her parents; sisters, Barbara Noe and Betty Romine; brothers, Albert, Fred, Gene and Phoenix Finney. Patricia is survived by her husband, David Carroll of the home; daughter, Cindy Lakey and husband Doug of Duncan; son, Stephen Clayton and wife Tiffany of Quinlan, TX, Jeff Clayton and wife Levia of Healdton; step daughters, Diana McGuire and husband Carl of Stroud, Shelly Hayes and husband Wayne of Manford, OK; grandchildren, Justin Lakey, Josh Lakey, Jare Lakey, Darshell Clayton, Shelby Clayton, Stephanie Clayton, Patrick Harris, Connor, Kyler, and Brenden; great grandchildren, Blazin, Brogan, Phoenix, Chloee, Bentley, Blaine, Skylar, Jordan, Alliayah, Dagger, and Taylan. Serving as Pallbearers will be Justin Lakey, Joshua Lakey, Jared Lakey, Thad Kassheimer, Joshua Kinard, Derek McCullar, and James Lakey. Honorary Pallbearers will be Roy Clayton, Ronnie Clayton, Ronnie Noe, Wilby Romine, and David Noe. Family visitation is scheduled for Wednesday evening from 6-8:00P.M. at Alexander Gray Funeral Home in Wilson. To send flowers in memory of Patricia Ann Carroll, please visit our Heartfelt Sympathies Store. Interment will be 2:00P.M.Thursday at the Stroud Cemetery. Provide comfort for the family of Patricia Ann Carroll by sending flowers. I am sorry for your loss. God is a comfort to you in this time of need. Because he cares for you. Cindy and family, I'm so sorry to hear of Pat's passing. I worked with her for 13 years, and there wasn't a harder working women than her. Compassionate, Caring, and Loving to a fault. Her patient's Loved her, and you never heard anyone say a bad word about her. I looked up to her and had the greatest respect for her. If anyone deserves a crown in heaven it's her, because she was an angle to many on earth. Jesus command's us to love others, and Pat set a wonderful example. I Pray Jesus wrap's his loving arms around each of you during this difficult time, and gives you peace.